Every now and again I have these brief periods of time where I lack the desire to play any video games whatsoever. I was going through one of these periods recently when my good friend and colleague Buddy Acker, who is no stranger to this feeling, recommended I play Child of Light. So I did. I managed to complete it in a couple of days and it brought me out of the funk I was in. I had such a good time playing it that I was sad when it was over. Having such a strong attachment to a video game again, for the first time in a long time, got me thinking: What are some of the SpawnFirst staffers’ favorite games they wish they could experience as if for the first time? BioShock captivated me from the second I saw the first trailer. It was mysterious, intense, and creepy all at the same time and I loved every second of it. It was actually the first PC game I had bought in years since, at the time, I only had the Wii, which BioShock never came out on. After I purchased my PC copy, I rushed home and installed it, only to find out that my graphics card was not powerful enough, and that I now couldn’t return it since I broke the seal on it. It was a colossal mistake on my part. Flash forward a couple months, I was starting my sophomore year at college and my roommate had brought his Xbox 360 this time around. So I quickly rushed out, grabbed a copy of BioShock, and began playing what became one of my all time favorite games. From the second I put the disk in, my roommate and I were hooked. He watched intently as I creeped my way through the halls of Rapture, mowing down splicers, and running like hell away from Big Daddies. The sheer intrigue and mystery that surrounded this underwater mad house was enough to keep me exploring for days, but it was the captivating story that kept me moving through the game. Who is Atlas? Why is Andrew Ryan such an a**hole? Sure enough, those questions were answered in one of the best and craziest twists I’ve ever experienced in a video game, and its the reason why I’ve played through the campaign so many times. However, nothing will ever top my first play through of BioShock. The thrill of exploring Rapture while holding the controller in a death grip as if it would prepare me for a splicer attack is a feeling I wont soon forget and sincerely hope another game will make me feel that way again soon. So, would you kindly do yourself a favor and go experience the marvelous BioShock. A lot of games have amazed me, but few have left me as awestruck as Shadow of the Colossus. At the time of its release in 2005 it was a monumental achievement. Nobody had ever played anything like it before. It was elegantly simple and beautiful. A lot of gamers like touting graphics nowadays; most games that release now don’t even come close to making my jaw drop like it did when I played Shadow of the Colossus the first time. But nostalgia has a way of sometimes permanently implanting rose-colored glasses into fans’ heads. I played through Shadow of the Colossus again recently in The Ico & Shadow of the Colossus HD Collection and it just didn’t feel the same. Maybe it was because I had been there and done that. Maybe it just isn’t a very good game anymore. Whatever it is, I wish I could go back and experience it for the first time again. But time devours everything. I had a few games on my short list for this feature. I could have gone with my obvious first pick which would have been Metal Gear Solid 3: Snake Eater but, against better judgement, I decided to deviate from my norm. As much as the Call of Duty franchise has stagnated in recent years, I still buy it every year because I want to give it a chance; mainly because of my love for Call of Duty 4: Modern Warfare. I was in my last year of secondary school when Modern Warfare came out. At times when I should have been revising for exams and doing coursework, instead I would lose hours to Call of Duty 4‘s online multiplayer; playing with my friends and forging new friendships online. Modern Warfare was the only game in the franchise that I reached 10th prestige, max level in; simply because it didn’t feel like a chore or a grind, because I was having fun. The story was somewhat decent for a Call of Duty game. 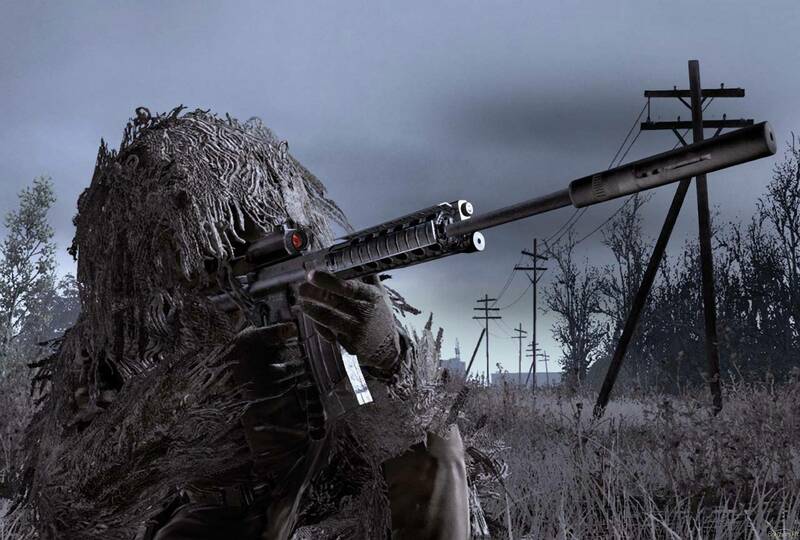 I still remember the thrill of playing through the missions ‘All Ghillied Up’ and ‘One Shot, One Kill’. I wanted a whole game in the same vein as those two missions. I remember the frustration of trying to complete ‘Mile High Club’ on Veteran difficulty, that’s something I don’t want to experience again. With Sledgehammer taking the reins on Call of Duty: Advanced Warfare for there first solo foray with the franchise; I hope they can capture the magic that made me love Modern Warfare so much. If there is one game that I wish I could make sweet, virgin gaming-love to all over again, it would have to be Demon’s Souls. Traversing through the sullen and soul-crushing lands of Boletaria for the first time was a humbling, yet extraordinary experience. Every locale, from the poison-filled gutters of the Valley of Defilement, to the suffocating confines of Stonefang Tunnel – each was a journey that required trials of not just skill, but also of will. Every region had its fill of dangerous areas, each of which was brimming with insidious and surprisingly deadly enemies. Going through these areas was no easy task, requiring the hapless player to take each measured step as if it were their last, not knowing what dangers lay ahead. And even if you did triumph over a few stubborn enemies, or a particularly menacing archdemon; the victory was an earned one. The path to any achievement was always lined with a countless number of deaths by the enemies’ hands. And that was the best part – experiencing Demon’s Souls for the first time. That humbling death when you took on a skelly that you sorely underestimated, the terror of hearing the chiming bell of the Mind Flayer as it sought you out. Sure, going through the game a second time was almost as hard as the first, especially in New Game +, but by then, all the wonderment of the maiden voyage was gone. You knew what enemy you would encounter, what booby-trap lay ahead, and what tactics to use to defeat a particularly hard boss (bite me, Maneaters). In closing, know that I’m definitely not burning up with envy (I am) when I see a friend try out the game. There’s nothing like the first time, especially with a game like Demon’s Souls. Senior Staff Writer Karl has been an avid gamer since the days of the original PlayStation, it's a passion that took ahold of him at a young age and one that never let go. When he isn't playing games he's usually writing about them, or listening to The Killers. Metal Gear Solid is quite possibly his favourite gaming series of all time, having only initially purchased a PlayStation 3 to be able to experience Metal Gear Solid 4.